I feel the need to clarify in any post that I am not announcing a pregnancy. Among life FAQ's, "How's married life?" barely tops "Are you pregnant?" Good and no, respectively. Thanks for asking. But back to our big news: We've been trying to adopt a dog for a few months now, but have always been beaten to the punch by other families for the last three dogs we've applied for (all rescues). Because we live in a two-bedroom duplex, a larger dog would make things... busy. We also wanted a dog that didn't shed a ton. With these things in mind, our options were surprisingly limited. On Saturday I was driving home from running errands, and I passed the Minneapolis Animal Control building, which is near our house. 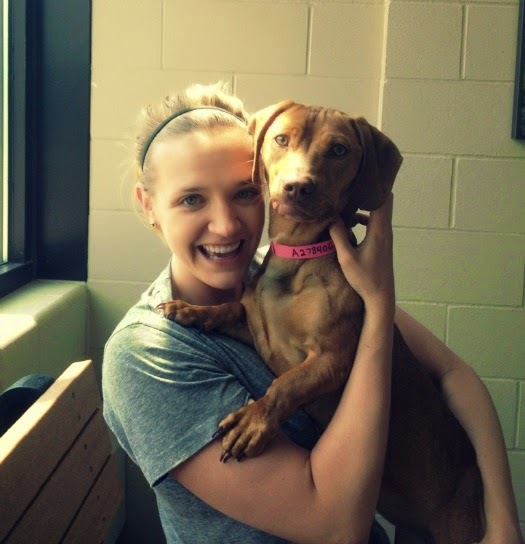 Outside, a volunteer was walking the cutest dachshund mix, and it was love at first sight. I knew nothing about MAC, or if they even adopted animals out of their location, so I drove home and told John that I had just seen "our dog". He was in the middle of putting the final latch on the fence he just built. Perfect timing! While he was finishing up, I Googled MAC to find out that yes, they did adopt dogs out of their building, and that they were open until 3:30 that day. We were on our way minutes later. When we walked in, a volunteer asked us what we were there for, and I told her about the dog I had just seen, and asked if "it" was available for adoption. She knew exactly who I was talking about, and confirmed that she was available. We walked past cages of barking dogs (so sad, I wanted them all!) but came to find "our dog" sitting quietly in her kennel. She licked us through the gate until the volunteer opened it. It only took a few minutes in the play room to realize that she was perfect, and exactly what we'd been looking for. What we know about her: She's roughly 8 months old, not fully house-trained (yikes! 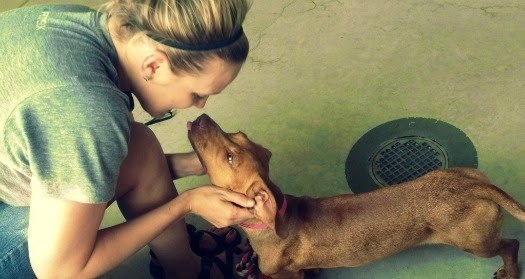 ), was surrendered by a family that could no longer afford her, and is currently named "Sassy" (yikes again!). She had not yet been spayed, so that's happening today and we'll be able to get her tomorrow. Now, instead of just cat pictures, you can expect to see some of our newest little lady, and probably an epic video of her introduction to Carl, who will likely just stare at her from the highest perch he can find. We're still working on his social skills. Pet name suggestions? Potty-training advice? Go. Awwww! She's adorable! 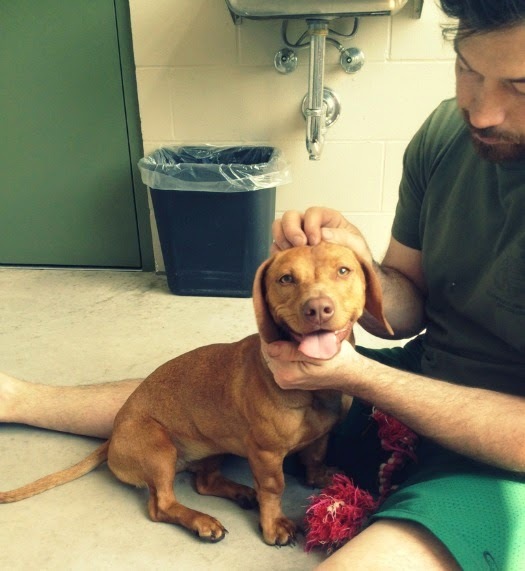 Looks like she could be part vizsla? Hit her if she pees. Yes! What a cutie (this coming from someone who doesn't like animals!). 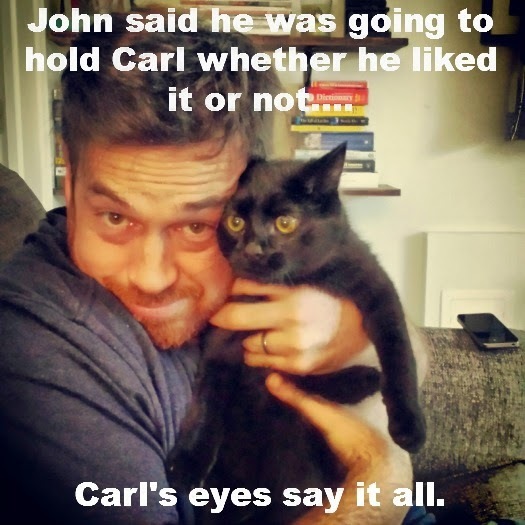 But, oh, that Carl picture almost takes over the post, love it!